Handmade Charlotte shows us some sweet new houses on the block — these Letterpress Paper Houses are part of a DIY build-it kit which is designed and sketched by hand, turned into letterpress plates and printed on a Chandler & Price Craftsman press. Swiss Miss highlights an alphabet made with books and clever numerical book sculptures by Paul Octavious. The New York Times reports on the telling and sobering statistic that 1 in 4 parents think some vaccines cause autism in healthy children. Lilsugar tells us more and more pregnant women believe there’s no place like home when it comes to giving birth — homebirths have risen 5% over the last five years. Heather from Dooce shares a photo of her baby girl’s custom pair of shoes designed by Johnny Marra, whose work we have also admired here on Inhabitots. 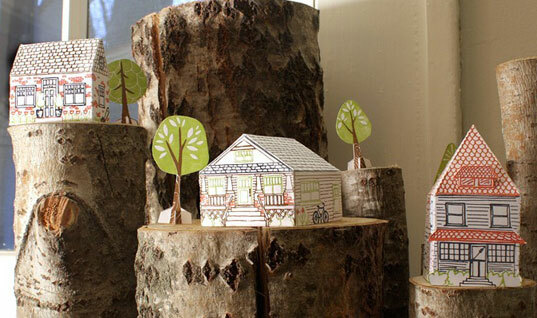 Handmade Charlotte shows us some sweet new houses on the block -- these Letterpress Paper Houses are part of a DIY build-it kit which is designed and sketched by hand, turned into letterpress plates and printed on a Chandler & Price Craftsman press.